There have been a few changes over at Twitter. In the drive to make everything more Mobile Friendly, Twitter has changed their Cover Photo (Header Image) size to 1500x421 Pixels. The sweet spot has become very narrow. Take a look at my Twitter Page and you will see that I am using very little text. As carefully as I can, I have placed that Text in the sweet spot that is visible in all formats. *Note: You are welcome to Follow me. I will almost always Follow you back. The exceptions are for adult content, content strictly aimed at personal relationships, and accounts entirely in a foreign language. Unfortunately, there are still many people who haven't taken the time to upload their profile image. They are still “only an egg”. Others have uploaded an image that is highly distorted. The best way to get the image to display the way you desire is to create one in the right size for the Social Network in question. I highly recommend the no cost (free) GIMP tool for Scaling (resizing) and/or editing your images. 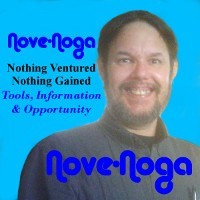 You can find a link and several simple Click-by-Click instruction sets on my Nove-Noga GIMP page. For my Twitter Management, I use the no cost version (free) of UnFollowSpy. It gives you some excellent tools for keeping up to date with those who have Followed and UnFollowed you in the last day. I have noticed several occasions recently when I have been UnFollowed by someone who is now following no one. After a spate of Tweets the other day, I have come to the conclusion that some accounts may have been hacked. I have been in the habit of sending a Tweet to some of the people who have UnFollowed me. It is fairly simple. You may have seen it if you UnFollowed me recently. Hi, (TwitterUser). Q: Who makes a good Twitter Follower? Just asking because you just UnFollowed me. Thanks, Nove-Noga! The other day, someone responded and I noticed a storm of Tweets on his feed. They ranged from simple goodbyes, to accusations of churning, to downright rudeness. Compared to many of them, my inquiry was polite. For those new to Social Networks, there is a lot to learn. For Twitter, one important thing to note is that as you reach the “Twitter Ceiling” of having Followed 2000 accounts, you need a similar number in those who have Followed you. Otherwise, Twitter will severely limit the number you can Follow each day. I started out by Following every IBO Associate Twitter Account until I bounced off the Twitter Ceiling. Now, I carefully UnFollow those who haven't Followed Back after a period of time. Recently, I slipped right through the Twitter Ceiling without a whisper of trouble. *Note: You should not Follow more than 50 in a day and you should not UnFollow more than 100. UnFollowSpy helps you keep track of this sort of thing. The point is this. There seems to be a problem out there. Parity between Following and Followers is essential for getting through the 2000 Followed Twitter Ceiling. So we have a tendency to Follow those who Follow us and likewise UnFollow those who UnFollow us. Maybe a little more communication is in order. A polite inquiry may alert someone to a problem that they did not know they had.